14-16mm/18-19mm expansion sleeve inserts and 160mm Inner Weights. Inner Weights have 30mm removable end weights to fit inside different lengths of bars. 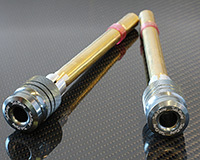 Fits sport bikes with 14-16mm or 18-19mm bar end openings. Additionally, handle bars should be hollow and straight to at least 140mm. *These models will fit our Bar Ends with 14-16mm/18-19mm Inserts. But we do not yet have a full list of which other bike models will fit the Inner Weights.